The Tualatin High School choir department has provided education and training in vocal music to students since the founding of the high school in 1992. 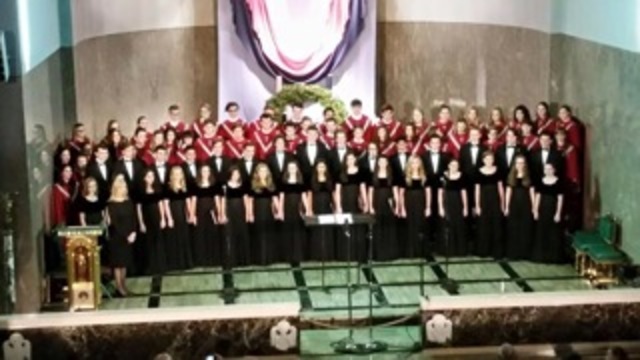 Under the direction of Kim Kroeger, the Concert Choir, the Crimsonnaires, the Treble Choir, the Tenor/Bass Choie and the Cadet Choir represent Tualatin High School. 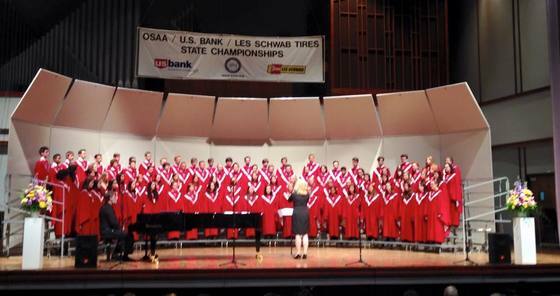 The TuHS Choir Boosters is a volunteer organization set up to assist the students with opportunities to grow in their knowledge of music and the performing arts. It is our desire to supplement our students’ current education in a way that will prove meaningful to both the choir and our community. We have wonderful opportunities for local business sponsorships, in exchange for having your business listed in our concert programs, newsletters, and Facebook feed. For more information, please check out this flyer. The Choir Boosters have many volunteer opportunities and we invite all choir parents to become involved. Please see our Volunteer page. Our general meeting is held on the second Monday of each month in the choir room from 7:00-8:00 pm. These meetings are a great way to meet other choir parents and gain information about choir events. The Tualatin HS Choir Boosters is a 501(c)(3) tax-exempt organization, and we actively seek tax-deductible donations to support our mission and objectives. If you would like to help us achieve those objectives, we accept donations through PayPal.